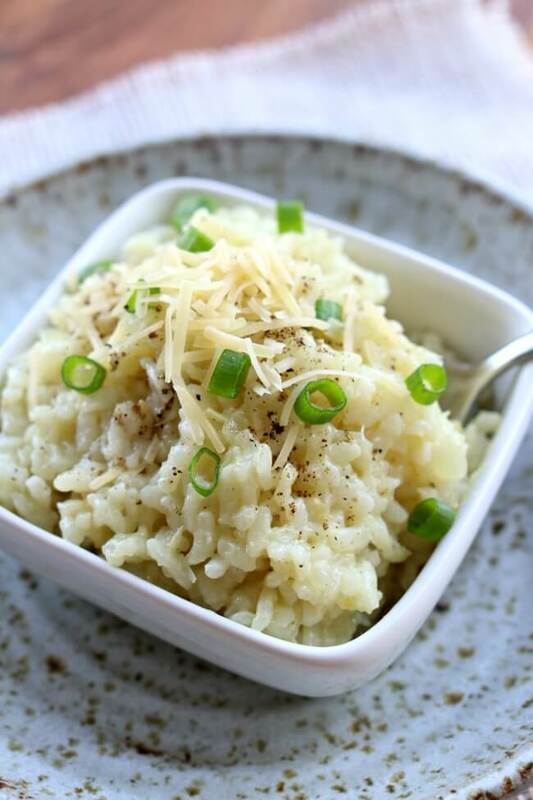 Instant Pot Parmesan Risotto–Creamy, no fuss and no stir risotto made in just a few minutes in your electric pressure cooker. Click here for a similar recipe that’s made in the SLOW COOKER. One of my favorite comfort foods is risotto. I love the creamy consistency but I don’t love all the stirring and babysitting that it takes when made on the stove top. That’s why making risotto in the Instant Pot or slow cooker is a game changer for risotto lovers. You can have risotto without a lot of fuss. 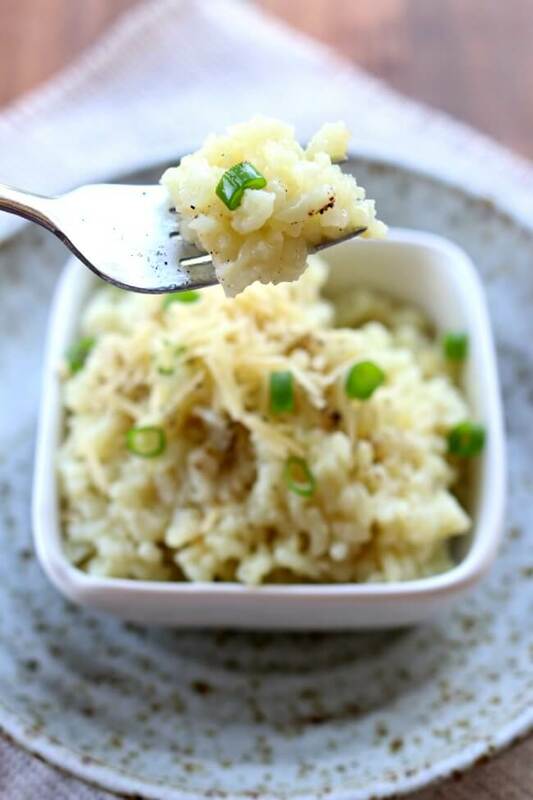 This recipe for Instant Pot Parmesan Risotto comes from a new cookbook called The “I Love My Instant Pot” Recipe Book by Michelle Fagone of CavegirlCuisine.com. Michelle includes family friendly recipes such as California Frittata Bake, Creamy Chicken and Broccoli over Rice, Insalata Caprese Mini Meatballs, Coconut Curry Sea Bass, and Asian Mushroom Sweet Potato Noodles, in the book, with a selection of celiac, vegetarian, and paleo recipes. Michelle says, “The more you cook, the more you’ll realize how versatile the Instant Pot® really is. In this book, you’ll find everything you need to know about how to use your Instant Pot®, including how to clean it, how to use the buttons, and what you should have on hand to make your dishes even better. As a new user of the Instant Pot I really appreciated the first chapter which is entitled “Cooking with an Instant Pot.” It explained a few things that were new to me and helped me feel confident that I could try new recipes in the pressure cooker. I’ve already tried a few of the recipes and they are super easy to follow and understand. I really want to try the Fish Tacos and the Creamed Corn and Creamy Key Lime Pie. The cookbook is at an affordable price point and if you’re looking for some new and exciting Instant Pot recipes I think you’ll really enjoy this cookbook! What Instant Pot/Slow Cooker Did You Use? For this Instant Pot Parmesan Risotto recipe I used this Instant Pot IP-LUX60 V3 Programmable Electric Pressure Cooker. It’s 6 quarts, so the same size as most slow cookers. It cost me around $80 on Amazon. When I made a similar recipe in the slow cooker I used this 6 quart KitchenAid Slow Cooker. If you’d like to see all the new recipes that I’m making sign up to receive my emails below! This is a free service and you can unsubscribe at any time. Press the Saute button on Instant Pot®. Add and melt the butter. Add the onion and stir fry for 3–5 minutes until onions are translucent. Add garlic and rice and cook for an additional minute. Add 1 cup broth and stir for 2–3 minutes until it is absorbed by the rice. Add remaining 3 cups broth, Parmesan cheese, salt, and pepper. Lock lid. Press the Manual button and adjust time to 10 minutes. When timer beeps, let pressure release naturally for 10 minutes. Quick release any additional pressure until float valve drops and then unlock lid. Ladle into bowls and garnish each with 1?8 cup fresh parsley (I garnished mine with green onions). 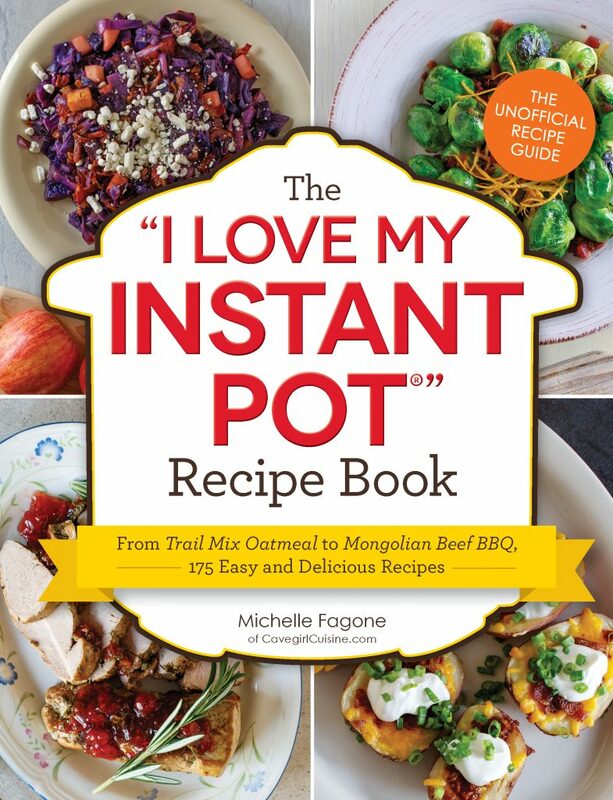 Excerpted from The I Love My Instant Pot© Recipe Book: From Trail Mix Oatmeal to Mongolian Beef BBQ, 175 Easy and Delicious Recipes by Michelle Fagone (CavegirlCuisine.com). Used by permission of the publisher, Adams Media, a division of Simon & Schuster. All rights reserved. Photography by James Stefiuk. Michelle Fagone is a mother of two young girls, an entrepreneur, and an avid Paleo food chef. She has a passion for healthy living and for sharing her unique insights via her recipes, her blog, and now her five cookbooks. Despite being a southern gal at heart, her travel and food experiences as a Navy brat and current Army spouse, have enabled a unique appreciation for worldly flavors. While comfort is the basis for most of her recipes, you will often find a twist of exciting flavors and combinations which makes her recipes not only appealing to a broad audience, but uniquely delicious! Arborio rice is a short-grained, starchy rice that lends itself so well to those creamy risotto dishes. Named for the city it was originally grown in, Arborio rice blends well with a multitude of flavors. Not only do savory dishes work well with this variety, but Arborio rice is also a great choice for rice pudding. So delicious BUT the pot was hell to clean up with Parmesan cheese stuck to the bottom which was a major job to scrape off. Any suggestions other than leave the cheese out (which I will not do)? Decrease time? Quick release? Add wine? Color me frustrated. Maybe don’t add any parmesan cheese until the rice is cooked. Then take the inner pot out of the Instant Pot and let it sit on the counter for a minute. Then stir in the parmesan cheese. This will help I think! Please sign me up for recipe email. It looks like you are already signed up. Have you had trouble receiving the emails? I have the Instapot Duo60 and it doesn’t have a manual function. I put it on low pressure cooking and I got a “burn” message. What function should I use to avoid this? Despite rice being burned on the bottom, it was tasty. Delicious! I even messed up and it turned out great. First, I was out of butter so i used mushroom sage olive oil. Then instead of dumping the onions in, i dumped the arborio in and had to fish it out . Then since there was still some rice in the pot, i barely sauteed the onions. I also added some sliced cooked Italian sausage and served with grated parm. Yum!! haha! I’m glad it worked out! Hooray! Glad to hear this Geri! Perfect. Omitted extra salt, used granulated bouillon, added chicken and mushrooms. Picky husband had 3rds, so success in my book. YES! Always a win when you can please those picky eaters. I made this on Monday January 20th. I used Knorr bullion cubes to make the chicken stock. For me using this is more economical and space saving. It was too salty. I am new to IP cooking but I think that I will not put salt in a recipe from now on if I use bullion cubes. yeah those bouillon cubes can be really salty! There’s never a need for added salt when you are using broth. Other than that nice recipe. Thanks! I mostly cook for myself and received a 6 quart Instant Pot for Christmas. I already love it as it makes the most amazing soups. I’m just wondering if this and other recipes can be successfully halved as I don’t want to be eating leftovers for days on end and if so what adjustments should be made. You can halve my recipes. Just make sure when you halve the ingredients that there is enough liquid for the pot to come to pressure (about 1/2 cup). This recipe was delish. I used the ‘Better than Bouillion ‘ for the chicken broth. For scaling recipes I love the ChefTap app. Very easy to work with. We can’t afford an instant pot right now. Do you have a slow cooker version of this recipe? I’m sorry, I don’t. Not for this particular one. I will get on it soon! This is a great recipe and extremely time saving. Do you have an suggestions for substituting orzo for the rice? Orzo would be really yummy. I’m adding this to my to do list because I want to try it out to know for sure how it would work. It would be different liquid amounts and cooking times. The easiest risotto I’ve ever made. Slaving over a burner with cream may produce a slightly better result but I’m really happy with this recipe and will use it often. I’m eating this right now. I made a few adjustments: added a diced red bell pepper, 5 diced chicken thighs, threw a couple of sticks of fresh thyme in, and added a little infused lemon olive oil (when I added the butter& onions). I made no other adjustments to time, or liquid. It’s perfect! It’s fabulous! Thank you! Those changes sound really tasty! Made it last night – delish, and the leftovers reheated surprisingly well in the microwave. I substituted white wine for the 1st cup of broth, but otherwise followed the recipe to a T. May I suggest that you tweak the cooking times listed at the top.of the recipe, to include the release time? Yes, I should do that! Thanks for the suggestion. Will this fit in the 3 qt mini instant pot? Also should the pressure be set on high or low for the recipe? Or can I use the rice setting and shorten the time. Yes it will work in the 3 quart. Use high pressure. And just use the manual/pressure cook button. Would I be able to double the recipe in the Instant Pot? Is it possible to triple the recipe in an 8 quart Instant pot? Just made this tonight and it was PERFECT! So creamy! I’ll never do risotto the old fashioned way again! Thank you! I made this last night and it was perfection! Thank you. I made it with basmati rice one night and it was so delicious! I didn’t change a single thing other then the rice and got so many compliments !! When you measure the rice, do you use a dry measuring cup or the liquid measuring cup? First time making risotto – and now I want to make it all the time. Hubs and teenage boy gobbled it up AND said it was great AND said teenager ate all the leftovers for lunch today. Cooked with Lamb Italian Sausage in the Pot for 11 minutes (live in Denver so added 1 minute based on other high altitude suggestions). Thanks, and we’ll be experimenting soon with other risotto recipes. I want to add mushrooms to this, can I just slice them and add with the rice and keep the timing the same? Yes, that’s what I would do! Can you use a different rice in this recipe? 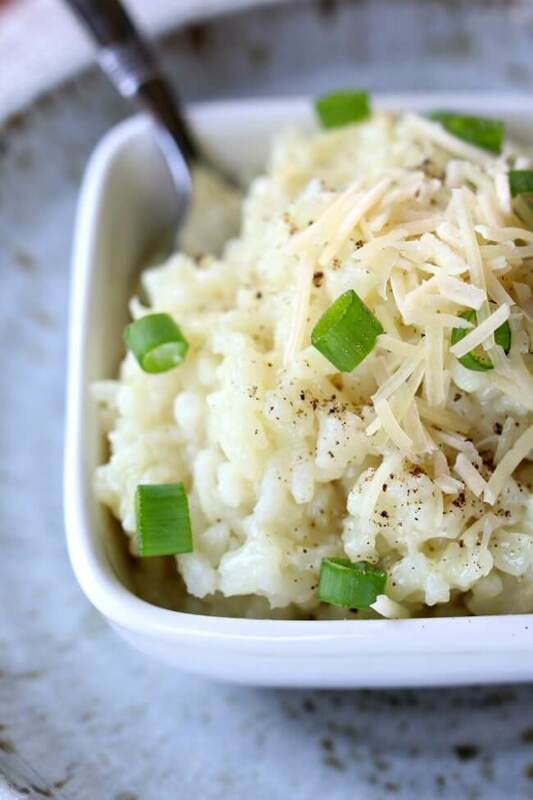 Arborio rice is the way you traditionally make risotto since it gets so creamy. I have not tried this with another type of rice. I am not sure how it would work! This is a great recipe! I love risotto but often don’t have the time to cook it. Can’t wait to try it with some of the other suggestions like white wine or cooking chicken or sausage at the same time. I live at 5300 feet and it comes out perfect with an extra minute of cooking time. I substituted 3 TBSP infused Black Truffle Olive Oil for the butter and also substituted a pinch of Pinch&Rub Black Truffle Fusion Salt for the regular salt. I also used about 1/3 cup parmesan cheese. Also added a pinch of red pepper flakes for heat. Unbelievably the most tasty and delicious perfect risotto I have ever had. The Black truffle flavor makes it a delicacy! When you add in the rice, do you cook it or wash it beforehand? Or do you just dump the uncooked rice without any preparation? I just dumped it in. This was really great! I used only 1.5 TBS of butter, 1/2 an onion, added a swig of white wine and 1/2 tsp of salt. Cooked on high pressure for just 6 minutes, and it was perfect! Hi! I would love to make this tomorrow but I have twelve people and don’t know how to confidently use my instant pot. If I triple the recipe above, can you please let me know the process/cooking time? Thanks for any help you might have! You can keep the process the same and the cooking time the same. It will just take more time to come to pressure. You might also want to allow a few more minutes of natural pressure release…like 15. Good luck! Thanks! That was my question – how to adjust cooking time when you increase servings. So no need to change the High Pressure cook time but increase NPR time. This was so good! I did have trouble finding Arborio rice in my town but found it finally in the bulk bins at the grocery store. As suggested by other reviewers, I added 5 frozen chicken breast tenderloins on top and did not adjust the linquids or cooking time and it came out perfectly! This might be my favorite Instapot recipe I’ve tried. Awesome, so glad to hear! Good idea on looking in the bulk bins. Thanks for sharing! Normally I follow a new recipe perfectly. In desperation to have a dinner on the table quickly, I threw in 5 raw italian sausages on top of the uncooked risotto. It all cooked in the 10 minutes under pressure. Thanks. I made this instant pot risotto for dinner tonight. I followed the recipe exactly except for substituting half a cup of white wine for some of the broth. It came out perfectly! I was so thrilled! I’m preparing the risotto for the 2nd week in a row! Simply fantastic! We poached and cleaned several chicken lobsters and are waiting to vent the rice before adding. Cannot wait! Can’t wait to make this my hubby loves Parmesan risotto but I never make it, I’m too impatient! Lol one question – is this in low, medium or high pressure? It’s high pressure. Good luck! Great recipe. I added some grated gruyere cheese and roasted asparagus at the end. Comfort in a bowl. This was absolutely delicious. Perfectly cooked and creamy. I added 1/2 cup of white wine, let it cook off and then 1/2 cup chicken stock before adding final 3 cups of stock. Any idea if cooking time needs to be adjusted if doubling the recipe? no need to change the cooking time! What about if you want to half the recipe? Does cooking time change? Wonderful recipe. I live at 5200 ft, so cooked at pressure an extra 2 minutes. It was perfect and creamy. I mixed roasted butternut squash in and we really enjoyed it! Oh, I like the idea of the squash! Thank you for the high altitude tip…I’m at 5300 feet (and an instant pot newbie) and I just tried this recipe for the first time. It turned out perfectly with the extra two minutes. Delicious! I’ll definitely make this recipe again! LOL this comment made me laugh – it was my reaction as well! I’ve never made risotto – the instructions always make it seem like too much of a production, so I’ve never attempted it 😀 This recipe was SO easy to do, and it tastes delicious – I’m serving it tonight with chicken fajitas, and the leftovers (lots of planned leftovers :D) will go home with my kids tomorrow when they come to visit 😀 The pinned recipe got moved to my Favourites board, and Risotto will now be appearing regularly on my weekly menus. I appreciate the feedback comments with ideas, too – I’m going to add chicken to mine next time! Great recipe! Turned out wonderfully and all without the constant stirring madness! This is supposed to be risotto. Instead, it is a gooey, gelatinous mass of chicken broth flavored pasta. Nothing creamy about it. At all. Made this tonight. I had to do some last minute adjustments because I discovered I only had 1 cup of rice. The recipe is easy and fast. It didn’t come out as creamy as I was anticipating, perhaps due to my poor math skills as I adjusted, but it’s still really awesome. This recipe will be in my future. Frequently. So great to hear, Tom! Love this recipe! I’ve made it about 4 times but this last time I included a twist. I added some chicken. I had seen recipes for cooking frozen chicken breasts in the IP and I looked a couple of them up and found that the time was almost identical to the time for this risotto recipe. So right before I closed up the pot I threw in a whole boneless skinless chicken breast and it worked out wonderfully! The chicken was fully cooked and tender and the risotto was still creamy and delicious. I was able to use 2 forks to shred up the chicken in the pot before serving. I won’t always want to add the chicken but it’s great to know I can! Was the chicken breast frozen?